So…the kit comes with a Basic Black Archival ink spot and you can make 20 gorgeous cards (in 4 designs) with just that. But, you know I have a penchant for doing up the inside of my cards – and my envelopes – so, I also pulled out my Blushing Bride, Mint Macaron and Mossy Meadow ink pads and got busy! but…since I already had the additional pads out.. I know – crazy pretty, right? And fun to make. The included Copper Baker’s Twine is….ridiculously wonderful! Hey, Stampin’ Up! – WE NEED THIS TWINE IN THE CATALOG!! Seriously. So – I can’t recommend this kit enough. Get it now. Get the refill at the same time. You won’t be sorry! P.S. 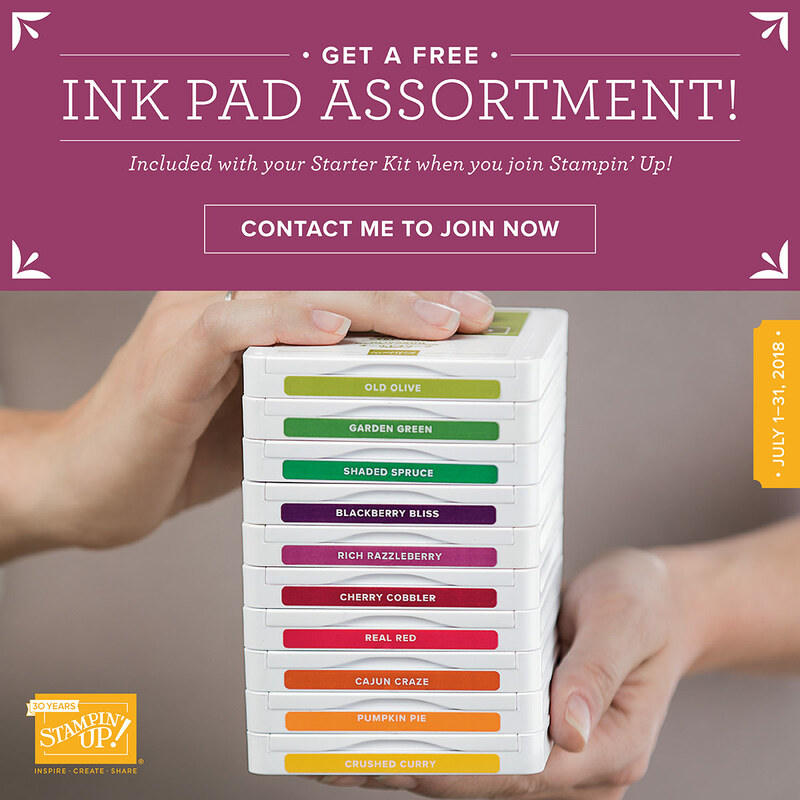 And – this is an AWESOME good time to join the team and get started on your journey towards wonderful perks and trips and discounts with Stampin’ Up! Don’t miss out on extra free INK PADS!! Now – you should know. I’ve packed for a LOT of trips – a LOT. I’m pretty good at it. Don’t really even have to think on it much. Heck – it’s the same stuff every time. You’re going to Seattle/Sequim for a few days and then on an Alaskan cruise with your other half. And then – all heck breaks loose! No – that is NOT an episode of Hoarders. When the stress began to bubble over, we took a little break and took the Man off to camp. I actually needed to get that out of the way so I could quit worrying about it. Uhm…no. Not at all true. Have a good time, Finny Bo-Binny! Love you more than chocolate. That sounds so unreal that you won’t see Finn until August. I’m sure packing is horrendously difficult but your cards were terrifically easy AND pretty. Yes, I am going to order that set to take to NY with me along with the Lots of Happy. I know you will enjoy both of your trips to the utmost. We are buying our clothes up north so I don’t have to struggle with more than one bag. Perry will be in a wheelchair so he can’t assist..even though I know he will try. We’ll just ship the clothes home when we’re done…kinda like your stamp supplies, huh! Have a wonderful wonderful time!!! Happy landings and bon voyage-s! Guess you know I love YOU more ‘n anything! Wow! The day is finally here! I am sure the actual trip will equal or surpass the anticipation of it! While it hurts a bit when our kids don’t look back when we leave them, at the same time it gladdens our hearts that they won’t be miserable while we are gone. Love your cards. I am not much of a ‘kit’ person, but I may have to get this one. If you move to Washington state, I will come visit you!